I learned an important lesson when I was a camp counselor: Never throw an unwilling camper into the lake, especially if one of his buddies is standing on your foot. I learned this lesson the hard way, for although the camper was unharmed (albeit, wet), his friend’s weight on my foot, combined with my momentum, broke the bone of my little toe. The truth is, I had never paid much attention to my ‘pinkie” toe up until that point in my life, other than to clean lint off of it. For the next few weeks however, I began to learn what an indispensable appendage that smallest piece of my body is. For one thing, what it lacks in size, it makes up for in intensity. I have learned that there is a kind of “nerve layer” that is part of any bone in your body. When the bone is broken, that nerve layer becomes very distressed, no matter how small the bone is. A bone is a bone, no matter how puny and silly looking, and pain is painful, no matter where it originates. Second, I learned how important the health of my little toe is to the rest of my body. My injury interfered greatly in ordinary physical activities. I couldn’t do many things that I normally did, like running, jumping, throwing campers in the lake – even walking was quite difficult and painful for a while. I had to limp in an odd sideways sort of way that eventually caused a great deal of pain to the rest of my foot, and my ankle. I contorted into even stranger methods of motion to ease that pain, and eventually my back became seriously out of line- all because of one tiny little bone in my foot. Even beyond the ways my puny little toe affected the rest of my body, the injury had ramifications for my greater existence in society. For more than a week I couldn’t even drive a car (it was the toe on the right foot). This had all sorts of implications, not least of which was my inability to get to the Laundromat. For a while I had to stand downwind of everyone. My little toe may even have had a hand in destiny, as it was a certain lovely young camp counselor by the name of Kari Perina who finally offered to help me in my distress, and run me into town for laundry and errands (‘this is the beginning of a beautiful friendship’). My point is this: though my pinkie toe seems insignificant, even unnecessary, I found I could not get along without it. And when I had to try to operate without it, it affected almost every aspect of my life (I’m not even going to mention bathing). The Apostle Paul is attempting to make the same point in 1 Corinthians 12:12-31, although without the enriching personal experience of a broken toe. This is a passage that is vital to the understanding and practice of house-church ministry. There is an atmosphere, a context for house-church ministry, and that context is what I like to call “body life.” A house-church group really doesn’t work properly unless all members participate in body life and use the gifts and blessings God has given them. Paul calls the church “the body of Christ’ and he expresses four main truths that this reveals. The first truth is that just as in a physical body, each part belongs to the others. We all have been called to “one Lord one faith, one baptism, one God and Father of all” (Ephesians 4:5). Paul describes the superficial differences that were predominant in his day: (Jew-Greek, Slave-Free) and asserts that that these are indeed superficial. In Jesus, we all belong to each other. The differences that we may be tempted to point to might include rich-poor, white-colored, expressive-quiet, or any one of a number of things. These differences are not as deep as the truth that if we are in Christ, we are all parts of the same body. “If the whole body were an eye, where would the sense of hearing be? If the whole body were an ear, where would the sense of smell be? But in fact God has arranged the parts in the body, every one of them, just as he wanted them to be. If they were all one part, where would the body be? 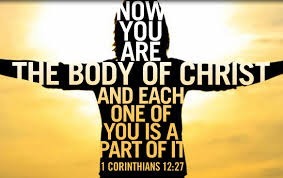 As it is, there are many parts, but one body.” (1 Cor 14:17-19). We are not all given the same personalities, talents and traits. We are given our differences so that the Church may function as a healthy body, with all systems operating correctly. There was a time, shortly after the accident I described above, when I felt like my whole body was one huge, throbbing toe. Believe me, it was not a pleasant experience. Trust me, the whole body was not meant to be a toe. In the same, way, we in the body of Christ are supposed to be diverse in our personalities, gifts, backgrounds, races and life situations. These differences do not mean that we don’t belong – but they do mean that we each have a different function to fulfill in touching lives according to God’s pattern. The eye cannot say to the hand “I don’t need you!’ And the head cannot say to the feet, “I don’t need you? On the contrary, those parts that seem to be weaker are indispensable…. The body of Christ needs all of its members to be functioning properly to be healthy. If one part is sick, the entire body is affected. Have you ever thought of Tabitha, the believer from Joppa? We will never know until we get to heaven, whether she spoke in tongues or not. We have no idea whether God used her to bring prophecy or healing. But we do know that she was used by God to help the poor, and this gift was so indispensable to the body of believers in Joppa, that God raised her from the dead to continue using her (Acts 9:36-41). The fourth main truth that Paul expresses about the church as the body of Christ is that each part needs to work together. This is very similar to the truth he expresses in Ephesians 4:16, where he writes: “From him the whole body, joined and held together by every supporting ligament, grows and builds itself up in love as each part does its work” (emphasis mine). Are you starting to get the picture? God has a plan for each and every member. If you are a part of this church (or any church) God has a special reason for you to be here. He wants to use you to touch lives in a way that he cannot use any other part of the body. It certainly will require some working together, and perhaps you alone cannot make much of a difference, but without you, the entire body will be affected. This is great news. You are special, unique and absolutely indispensable. In the body of Christ, you are somebody. You also have a responsibility to participate in body life, so that God can use you. You might decide that you cannot be used, or that you are to insignificant. But if you decide that you do not want to be used, or you do not make yourself available to be used, you like my little toe, could end up affecting the very backbone of the body. Now, you don’t need to become anxious over your responsibility. You can only function as part of the body and do your piece, as you depend upon the power of the Holy Spirit. You need only to be willing and available and God will see to it that the details of how you are used work out.You should not be anxious, but instead, rejoice that God sees you as important in his plan to touch the lives of other people. Rejoice that He will give you the wisdom and power you need to be a properly functioning member of His body- even if you are just a little toe. Your church might need your wisdom, given you speak up. We might need your prayers. Perhaps it is your willingness to serve, or your skill with tools, or your solid dependability, or your education, or your administrative ability. I hope you get the picture: the list is endless. You are somewhere on it. Don’t be the broken toe, remember that each part of the body needs the other parts.